Last Easter I made an Instant Pot Lemon Cheesecake that was so delicious that everyone begged me to make them one. I thought they meant that I should make one for the following Easter family gathering. But I was wrong! Instant Pot Lemon Cheesecake with Lemon Curd poured on top. I had several nieces, nephews, and even my cousin’s husband, ask if I would make them a cheesecake at various times during that year. And it couldn’t be any cheesecake, it had to be my Instant Pot Lemon Cheesecake. I offered to make our famous Oreo cheesecake, but they declined. And when I was asked at Thanksgiving if I would make my niece a cheesecake I automatically assumed that she wanted a Pumpkin Cheesecake. She was planning to bring a dessert to her first Thanksgiving at her in-laws. 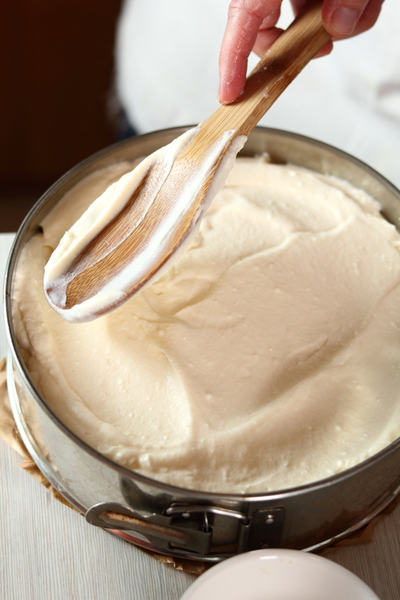 Be sure to start with room temperature cream cheese whenever you make a cheesecake. Both pumpkin and apple pies were already on the menu. So she wanted to bring something unique. Therefore, she begged me to make her a lemon cheesecake. Because they are so easy to make in the Instant Pot, I agreed. And since that time, she has received her own 6 quart Instant Pot Duo. So yes, I have taught her to make her own for next year! 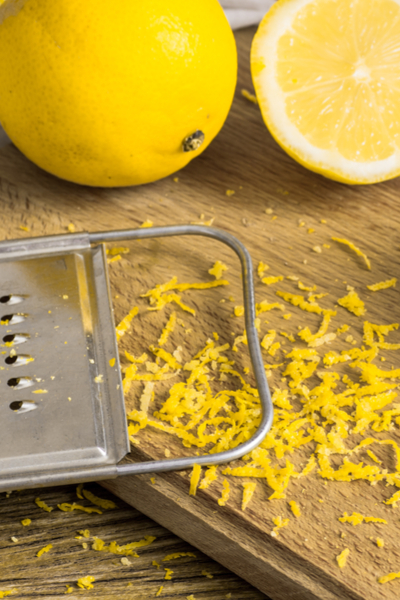 The combination of lemon juice and zest makes this recipe a favorite for many! 1. The cream cheese must be at room temperature for it to mix properly. 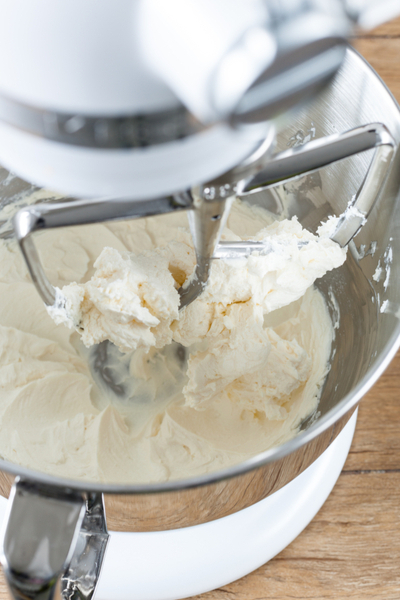 If you use cold, or even semi-cold cream cheese, your batter will have lumps of cream cheese scattered throughout it. 2. It is best to use a 7 inch springform or push pan for this recipe. Yes, a 6 inch one will work, but the cheesecake will be taller and require more cooking time. On the other hand, if you are using the 8 quart Instant Pot and are using the 8 inch pan, you will need to decrease the cooking time accordingly. Spread the batter evenly in your springform pan. 3. Probably the most important tip of all. DO NOT OVER MIX YOUR EGGS. Add them one at a time to the batter and stop mixing as soon as they are incorporated. Otherwise you will have a puffed up and irregular looking lemon cheesecake. 4. Be sure to foil both the bottom and top of the pan. It will help prevent any leaking of older, or misshaped pans. And the top is protected from any moisture that may get in the pan during the cooking process. 5. Be sure to make a foil sling or purchase a silicone sling to easily insert and remove the pan from the liner of the Instant Pot. 6. Don’t allow the cheesecake to sit in the Instant Pot greater than the 10 minutes that is required to Naturally Release The Pressure. Once the 10 minutes is up, immediately release any remaining pressure and remove the pan onto a cooling rack. Cover the entire pan in foil. You can use just about any crust that you like as the base of your Instant Pot Lemon Cheesecake. In fact, many people make cheesecake without any crust at all. Typically I prefer to make a graham cracker crust for my basic cheesecake recipes. Crushed graham crackers along with a little sugar and melted butter and you have a delicious and easy to manipulate crust. However, I have found that a crust made out of vanilla wafers is my favorite for this recipe. You can use whatever type of crust that you prefer, or none at all! I follow the same concept as the graham cracker crust, but use the little cookies instead. For those following a low-carb diet, crushed pistachios or walnuts make for a delicious low-carb crust. And I have heard that both coconut flour and almond flour make fantastic crusts as well. However, I haven’t personally tried them. Is it necessary to top your cheesecake? Absolutely not, but you could. The Lemon Cheesecakes tastes amazing without any additional toppings. However, if you want to impress your guests, a little topping goes a long way. Lemon Curd spread on top of the cheesecake with a little slice of lemon and blueberries on each piece. We prefer to add a thin layer of Lemon Curd to our cheesecake. 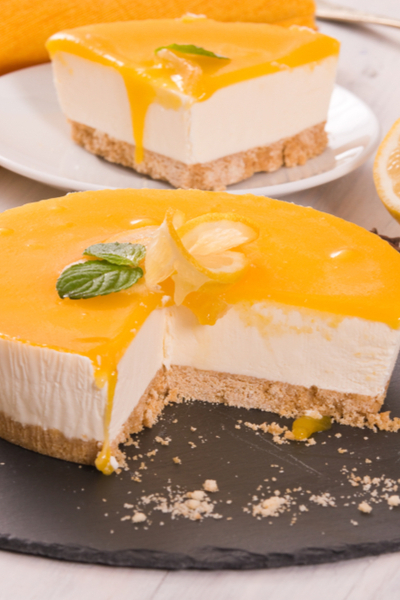 It not only looks beautiful, but that extra taste of lemon really sets this cheesecake over the top. However, feel free to get creative. Candied lemon slices are also a great option. And how about making a light meringue topping with egg whites? The options are endless. 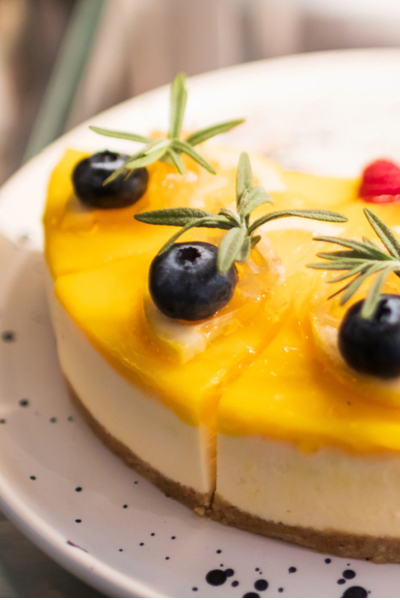 So if you make this recipe, send me an email at contact@makeyourmeals.com and let me know what you did to dress up your Instant Pot Lemon Cheesecake! A creamy and delicious cheesecake flavored with lemon juice and lemon zest and made quickly in the Instant Pot Pressure Cooker. In a large Ziploc bag, add vanilla wafers and crush into fine crumbs. Measure out 1 cup of the crushed wafer and place in a medium size bowl. Add the butter and sugar and mix until well combined. 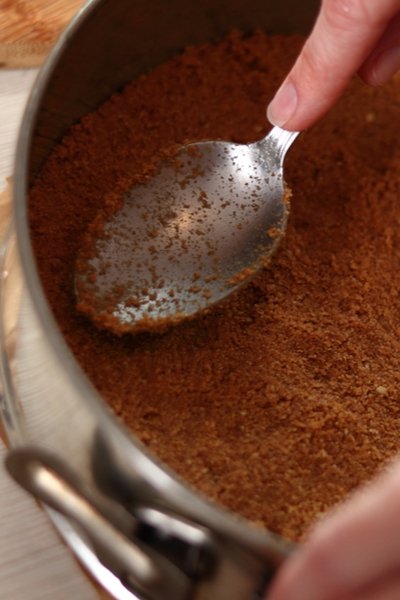 Press crumbs evenly/firmly into the bottom and half way up the sides of a 7″ springform pan. Place pan in the freezer until ready to use. In a large mixing bowl, mix the cream cheese and sugar until smooth. Add the sour cream, lemon juice and zest, and vanilla extract to the mixing bowl and blend until combined. Add in eggs, one at a time, and mix just until combine. Do not overmix the batter or your cheesecake will turn out lumpy. Remove springform pan from the freezer and wrap the bottom portion with foil. Pour the batter on top of the crust. Cover with top of the pan with a paper towel and then a piece of foil. Neither should be touching the batter. Prepare a foil sling by taking an 18” strip of foil and folding it lengthwise 2-3 times, set aside. You will use this to lower and remove the pan in and out of the Instant Pot. Pour 1 cup of water into the pressure cooker and place the trivet in the bottom. Carefully center the springform pan on top of the foil strip and lower it onto the trivet. 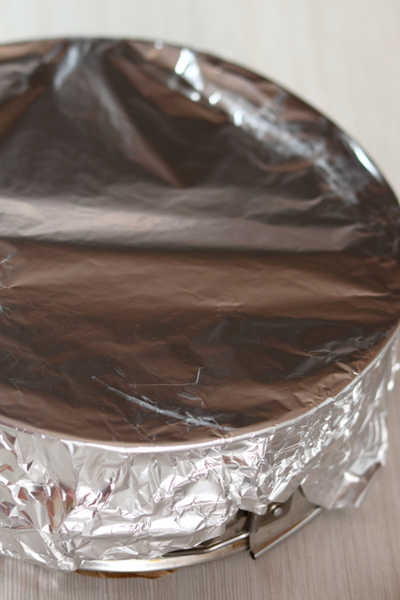 Fold the foil strips down so that they do not interfere with closing the lid. Lock the lid in place with the vent in the sealing position. Pressure Cook/ Manual on High Pressure and set the timer for 35 minutes. When the cooking time expires, turn off pressure cooker and allow for a natural pressure release for 10 minutes. Then quick pressure release any remaining pressure. Immediately remove the cheesecake from the Instant Pot by pulling up on the foil sling. Set on a wire rack to cool. Remove the foil and paper towel from the top of the pan. If a little water is sitting on top of the cheesecake, carefully blot it with a paper towel. When cheesecake is completely cooled, cover it with plastic wrap and cool at least 4 hours before slicing.